Oh Wedding cake! My favorite part of the wedding is tasting each flavor of cake my couple has selected to serve their guests. 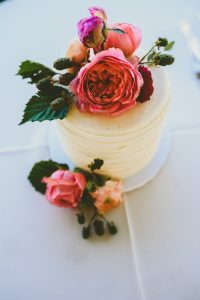 While wedding cakes historically have served as the main staple to the wedding experience, I have found my clients navigating away from it for a variety of reasons. Some of those being cost, wanting to be original with a different dessert for their guests, cake goes uneaten, and so many other factors. Call me traditional, I love wedding cake. I think my team loves cake even more than me! There is something so special about cutting the cake, having your guests enjoy it, and then getting to save your top tier to eat with your honey on your 1 year anniversary! Because I am traditional in a sense, I push my clients to do a cake, even if it means doing a small cake. I have created a list of ways to save money on cake. I apologize for all my cake bakers out there! As a planner, I always look for ways my clients can stay within their budget while getting everything they dream of for their wedding day! Having something small is perfect for photos and the cake cutting formality! We have drifted away from having a huge cake and into small ones for the sake of aesthetic and tradition. It is more than half the cost to do something small for this and then serve your guests sheet cakes that are pre-cut in the back! Adding to tip #1, when having a small cake for cutting, you will want to have sheet cakes in the back. Your baker will make it look just like the cake you are cutting in front of your guests, therefore they won’t know the difference! It will save you big bucks and is easy and clean to cut slices that look beautiful on the plate. 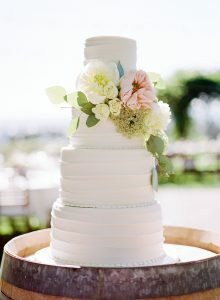 Wedding cake detailing can rack up the costs with your cake decorator. The more detailing, the more time it takes them. Have your florist provide cake flowers that can be placed when your cake is delivered. Flowers are fresh and beautiful so it is a win win! Remember that about 50% of your guests eat the cake. Being behind the scenes in the kitchen cutting and plating your cake, we end up boxing up half of your cake to send home with you. 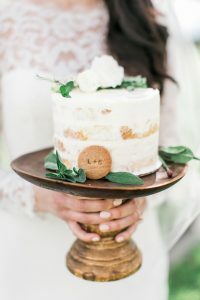 Almost all of my clients like to believe every guest will eat cake, they just won’t. I have never seen that happen! I hope you brides find this helpful!